There are many counterfeit or fake batteries bearing the AW brand and their packages are almost identical with the genuine AW batteries that we offer. You can be assured that we buy only genuine product directly from the original maker. 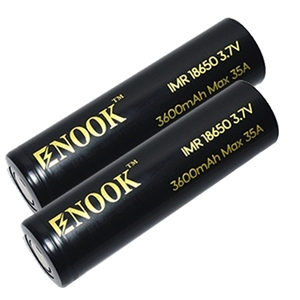 These counterfeit/fakes started to appear during the recent years when electric cigarettes became popular, especially the IMR (Li-MN) series because these are the ones mostly used to power e-cigarettes. Although these batteries are almost identical in packaging, they are NOT genuine AW batteries. There have been many reports on flashlight forums and electric cigarette forums describing how these cheap counterfeit/fakes exploded, overheated, leaked, etc. which is very dangerous to the user. Other issues include severe voltage drops, low capacity, fewer recharges, and very short operating cycles. These issues are unheard of on genuine AW batteries and that is why AW batteries are still know to be among the best quality Lithium batteries available. VapeTime has a modern computer driven battery load testing machine that tells us exactly what a battery can actually do in real world conditions. So far, we have not found a single battery that quite matches what an AW battery can do for an electronic cigarette. If and when we find a better battery, we will thoroughly test it and if it truly matches or exceeds AW, we will offer it to our customers. Yes! Genuine AW batteries cost a bit more. This is because they cost more to produce and they are worth it. Here are some tips to help make sure you are getting the original genuine AW products. 1. Only buy from established reputable dealers. 3. AW batteries never have been and will never be sold to companies in Mainland China. If you are buying from a company in Mainland China or if the batteries were shipped out from Mainland China, then they are counterfeit/fake AW batteries.